‘Children of Nowadays’, as we Nigerians would say, exasperated or marveling at some stroke of childhood genius…or not. Sometimes, hand on large African hips, an adult finger would point back at child… inquiring and seeking confirmation. All of which I did recently when J, daughter #1 said something to me about being fashionable. First of all, I’ll have you know that this is the same daughter who announced a few months ago that she wanted to go to ‘Tennessee’. I was shocked, she knew nothing about The States and yet she knew Tennessee. But then she mentioned Hannah Montana and I understood! With a fair amount of fear, for I do not, absolutely do not want, need, feel like having Hannah be the role model for my children! 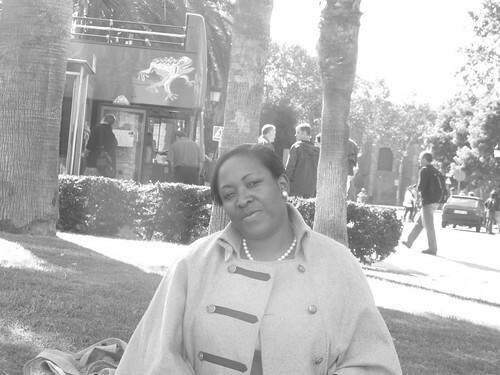 So back to our conversation – in stylish Barcelona, I asked her back, daring her to say otherwise ‘Am I fashionable?’ First there was silence, which was rapidly followed by lots of smiling and then finally, playing the pacifist and politician she said ‘ Sometimes’. I was quite surprised, and quite unsure of how to react. Shocked because I didn’t realize that she paid attention to my chameleon streaks – some days the chic, other days not! And all this from a Miley Cyrus loving girl who has only recently transitioned from hippy chic to ‘chic proper’ herself. That discussion was to repeat itself on many occasions – when I donned my extremely fashionable grey poncho coat – she commented without prompting and then when I put on my high-heeled brown shoes, purchased in a fit of extravagance in a cul-de-sac shoe shop in Rome. On the said morning, the kids were in my room, everyone getting ready for the day. I put on the shoes, a lot more conscious of the fact that there were now two daughters watching me. Not that I want to be the Super Hero Mum but I would love for my daughters to see me both as the woman who could and loved to cook but also who could do it all and still look good. So, I put on these high heels. Did I mention that I hate heels? I often wonder if one could retrain feet to love 2 or more inches. Short as I am, I am addicted to my earth-touching, staying-connected-with-the-universe flats. They look so, so girly, and are so, so comfy. I put the heels on. J said, ‘Lovely shoes, are they new? I said ‘No, I’ve had them for a year, I got them in Rome’. She then said, ‘But you’ve never worn then’ and I said ‘I have’. I didn’t let on that they pinched my small toes and gave me etalage benen, (Dutch for window-shopping legs) such that I couldn’t do more than casually stroll with them, stopping for respite every few minutes. Downstairs, while they breakfasted on some French Toast, I calmly took off the heels, put them in a bag, which went in my tote and then slipped into more sensible shoes. J noticed. She said ‘Why are you taking off your shoes?’ I said ‘Well I need to wear flats cause they are easier to walk in’. I went on to explain that a lot of women did that – have two pairs of shoes which they wore in a structured manner. She responded ‘You needed to take them off or wanted to?’ I calmly answered her, ‘Wanted to’. I did let her know for a fact that I would be wearing the brown shoes as soon as I got to the office. And wear them I did. Pressed down, pushed together and not giving up, I walked about in them the entire day. I’m proud to say at the end of it all, rose-hued corns and all, I felt more stylish than I had in a very long time. And if I were to think of super stylish offerings, I must say this simple puff pastry bake is up there with the rest – very fashionable! I love it because it has all the great elements of a holiday brekkie – simple to make, can be prepared ahead, looks stunning and is a pleasure to eat. A worthy replacement I think for the croissants and pain au chocolats of this world! 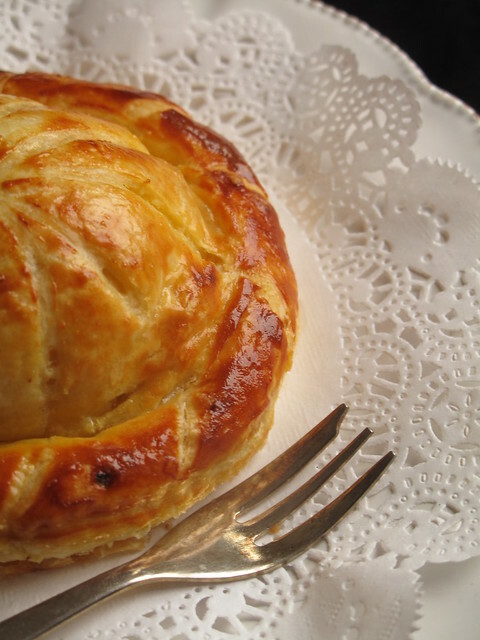 A Pithiviers is a type of cake or large pastry made in France. 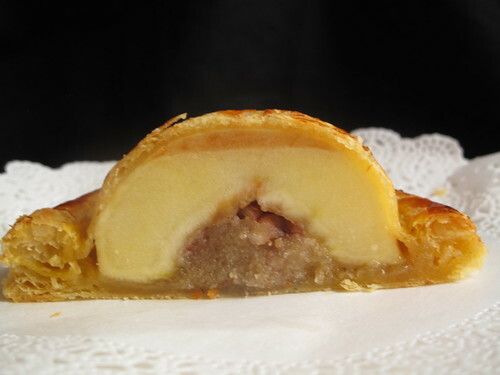 It is usually about 10 inches (25 cm) wide, with a top and buttom crust made of puff pastry, with a dense almond paste (“Crème d’amandes) filling inside. The top is rounded and higher than the edges, and slashed, typically in a starburst pattern. 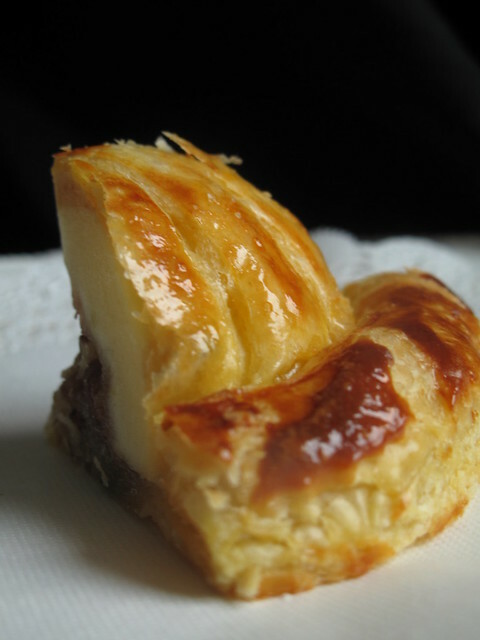 The origin of this pastry is credited to the town of Pithiviers in the Orleans area of France. Both sweet and savoury versions exist! I used to love tearing out great recipes from food magazines (bad behaviour I know), till I grew up and turned responsible. And then I regressed when visiting my sister (a non-foodie) recently in Scotland. See, she’d inherited a bunch of old mags – some recipes I photographed, others made a conscious split from the centre binder. It was in one of these I first saw a pithivier recipe. 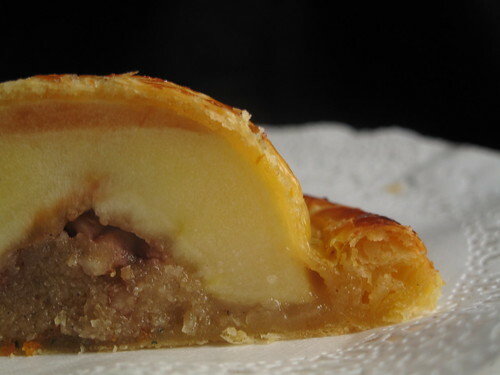 The original recipe uses mincemeat and uncooked apples to create this French masterpiece. I made two versions – using raw apples and wine poached and stuffing all with a combo of gently toasted pecans and homemade frangipane (in Dutch, Amandelspijs – almond spice). They were almost equally delicious! This ‘cake’ is also known as ‘Galette de rois’, served with a bean or a charm in it on Twelfth Night. 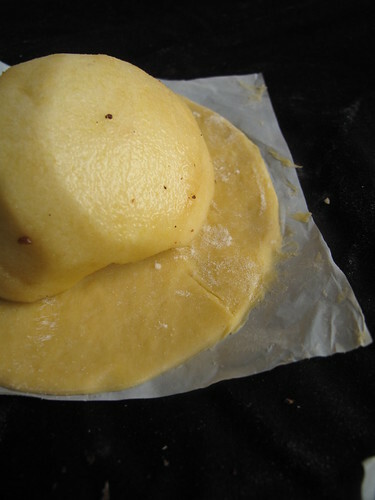 Cut out individual pieces of parchment paper on which you can place the puff pastry discs. Roll out the puff pastry, which should be 3-4 millimetres thick. Cut it into four 13cm discs and four 15cm discs. 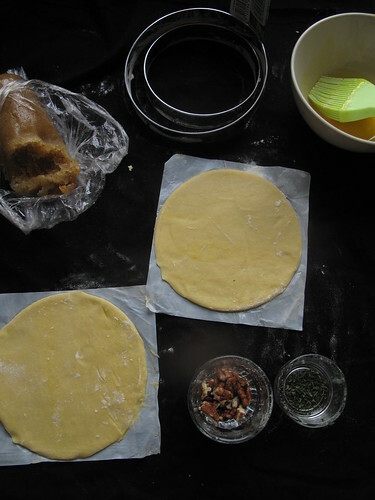 The 13cm,smaller discs will form the base of the pithivier and the larger 15cm ones, the top. Stuff the apple core with some broken pecans and a small ball of amandelspijs. 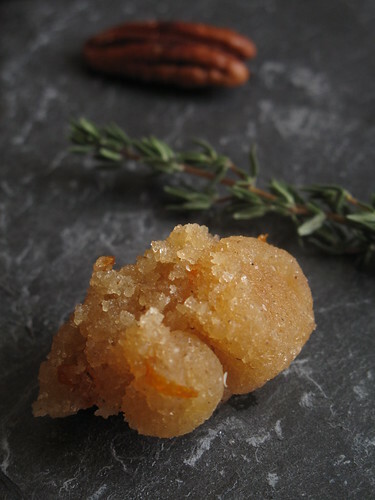 If using, sprinkle some thyme over the top of the amandelspijs. (I loved the taste and flavours of the thyme)! 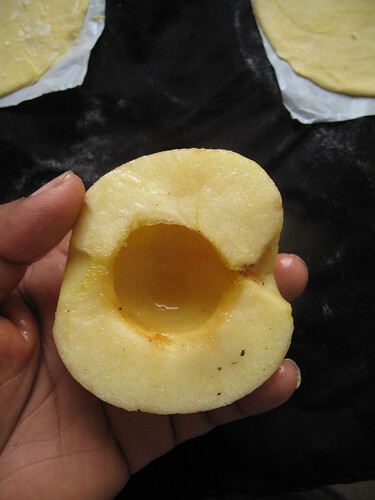 Place cut side down, and rounded side up in the centre of the disc- you should have at least a 1cm border round the apple. Repeat for all pithiviers. 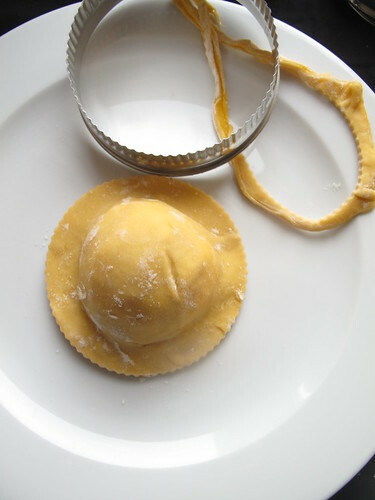 Brush egg yolks on the exposed pastry bottom rim, with outward motion (much easier), round the edges to form the seal. 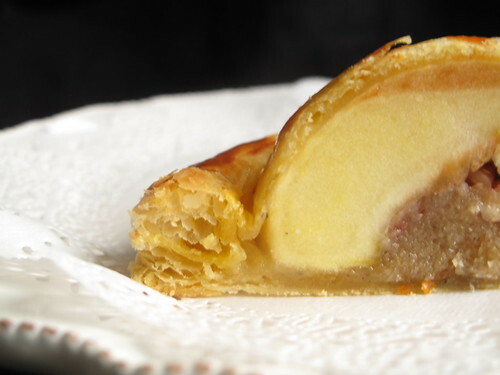 Place the larger rounds over the top of the bottom, ensuring that you mound your palm so the pastry rests on the apple and firms up the shape. Press or crimp the edges to seal. 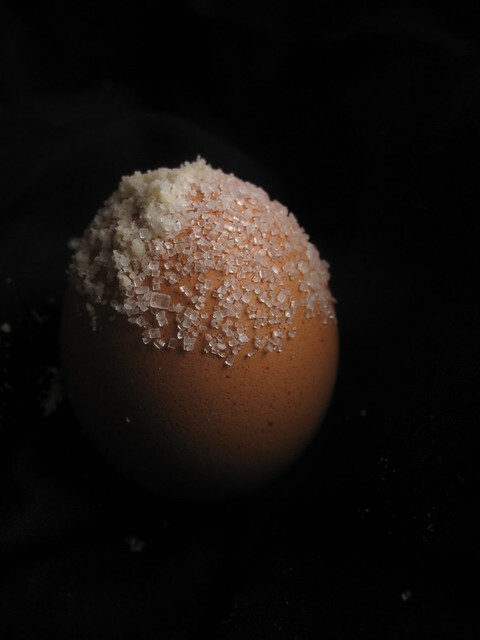 Refrigerate for an hour, along with the remaining egg yolk which you will use in a couple of steps. Remove pithiviers from the fridge and trim the edges with a 14cm cookie cutter, this will make the edges look neat but isn’t essential. 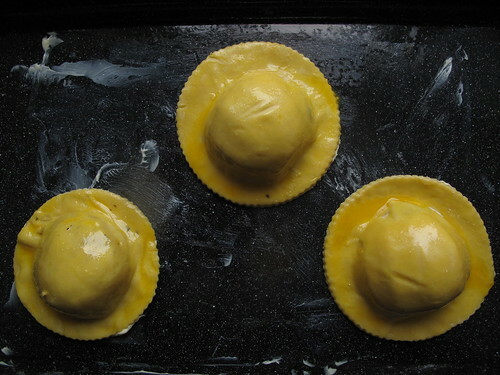 Brush the remaining egg yolks over the top of each pithivier to ‘eggwash’ them. Return to the fridge for 30 minutes to set. 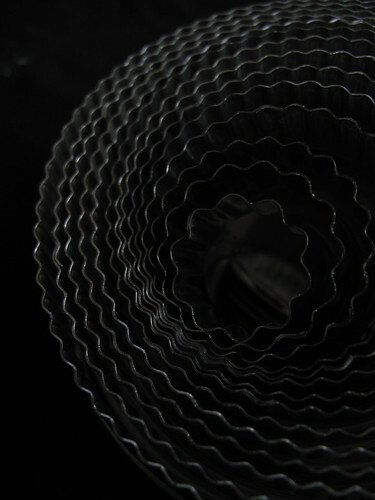 If baking now – preheat the oven to 200 deg C. Finally remove the Pithiviers from the fridge and using the blunt/dull side of a knife, make a Catherine wheel pattern – curved lines which originate at the centre but arc out towards the base – a bit like the underside of a mushroom. 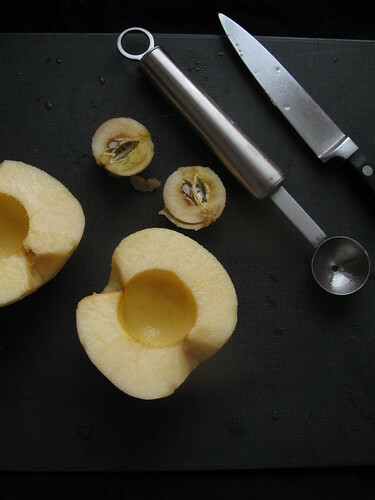 Then using the knife, score round the base of the apple – this will help the rim fluff up and ‘seperate’ from the core. 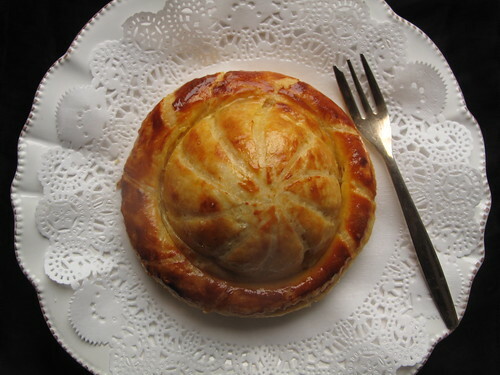 The pithiviers can be refrigerated overnight at this stage or frozen for at least a month. 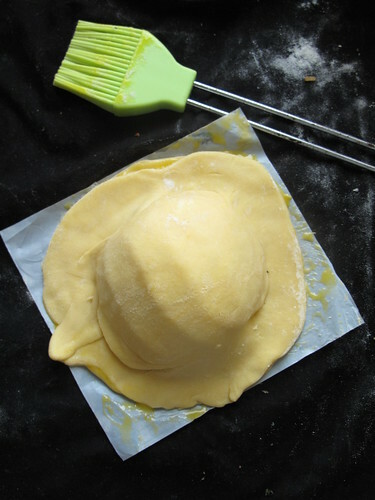 Both the refrigerated and frozen pithiviers should be cooked from the ‘cooler’. 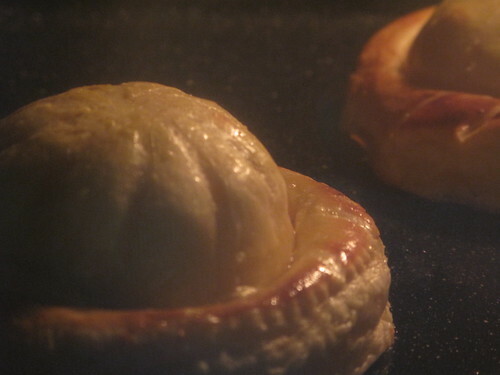 Place on a well greased oven tray in the centre of the (pre-heated) oven and bake for 18 – 20 minutes or until the pithiviers are golden and risen. 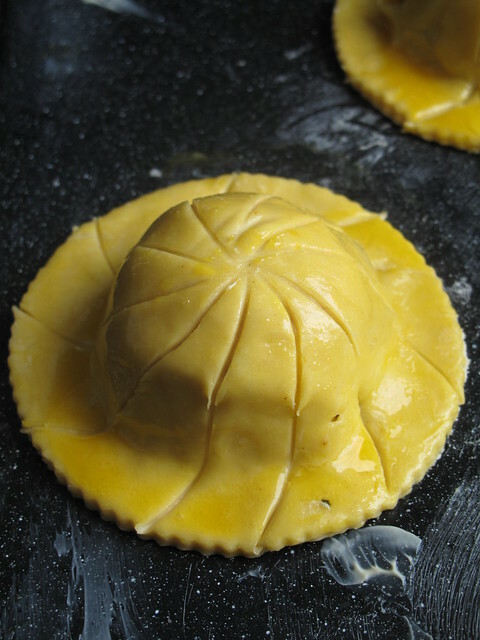 Enjoy gorgeous, bronzed and shiny pastry – see…the egg yolk wash did its magic. 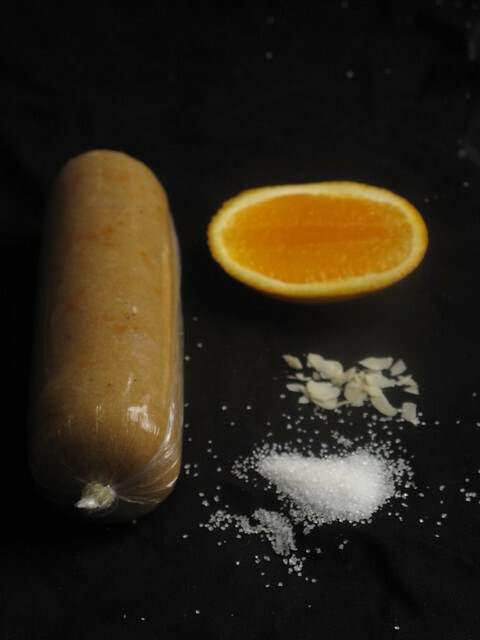 And the internal order of all the other ingredients – trés bon! 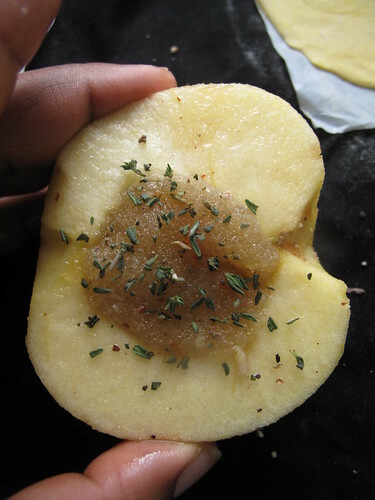 Make poaching liquids by combining all the ingredients except the apples in a medium sized pan. Heat up till the sugar is dissolved and begins to look syrupy, about 5 minutes. Add the apples to the poaching liquid and poach for 10 minutes till the apples just soften. Remove from the liquid and set out apple halves on a cake rack to drain. You can cook the syrup down till reduced by half and store in the fridge or serve as accompaniment to cream and custard! Make the amandelspijs by combining all the ingredients together in a bowl. Using a wooden spoon, mix all the ingredients together till well combined. Then collect into a ball and place on a large piece of clingfilm. 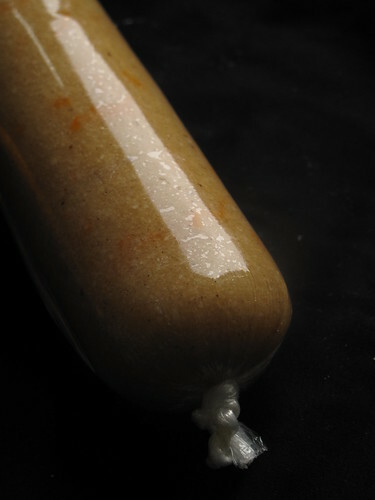 Place the mix in the centre and gently shape into a sausage-style log, measuring about 15 cm. Once rolled up, seal both ends and place in the fridge to rest. 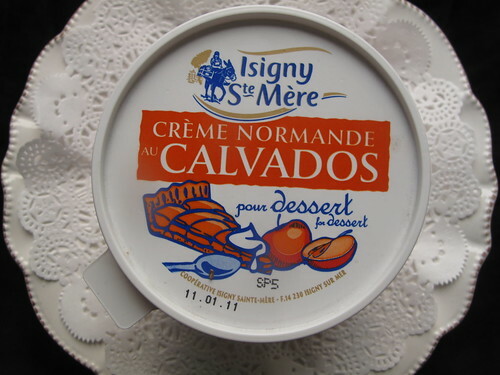 The husband and I loved it, with some Creme Normande – a combination of cream fraiche, mixed with whipped cream, icing sugar and Calvados. 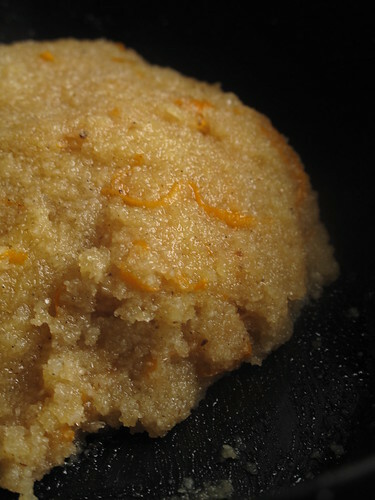 The pastry was flaky, the almond filling – soft, creamy and well flavoured with orange. 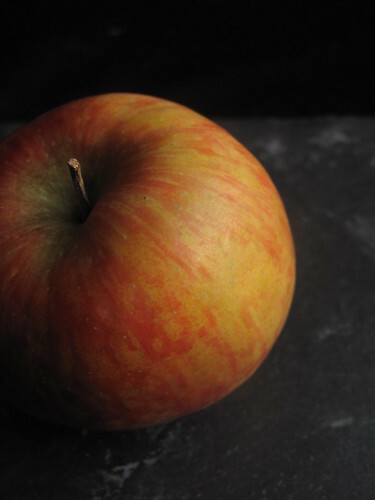 The pecans lend some crunch and the apple finishes it off with its fruity flavours and flesh. Definitely another keeper – next stop a chicken and mushroom savoury version! I’m also sending best wishes to Julia of Melangér, as she left a comment on this post, saying she was intrigued by the Pithiviers. It triggered a phone call to my sister in Glasgow and the exchange of the original recipe (made with mincemeat and uncooked apples) by phone…while I scribbled furiously! LOL and have a blessed week everyone.